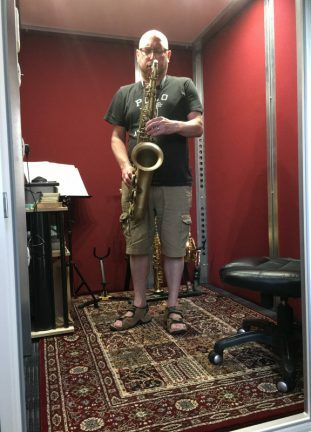 “I have been looking for a solution to practicing my saxophone at odd times of the day and night that allows me to play out and uninhibited and without disturbing my wife or the neighbours. I found the complete solution in the Amadeus M-Pod. 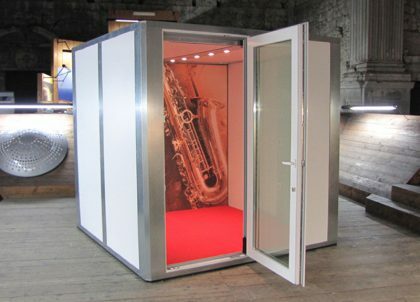 The M-Pod allows me to practice the sort of material which is essential to my development as a saxophonist but, to be honest, is not particularly great to listen to – e.g. long tones, scales/arpeggios, altissimo register, multiphonics, repetitive drills and patterns etc. It is important that the whole dynamic of the instrument is explored and I can play at full whack early in the morning or late at night with the confidence that I am not going to get any complaints. I purchased the smallest M-Pod (1.8m x 2.3m) and it is the perfect size for solo practice. In fact, it feels like you are entering a bubble and I think that the feeling of isolation and sanctuary is great for serious and intense study. The team at Amadeus have been fantastic. John helped me to select the most suitable M-Pod for my requirements, Dariusz and his team were brilliant at installation and Lorenzo and Andrew were extremely helpful in sorting out a technical issue for me. All in all I can’t recommend the company or the M-Pod highly enough.